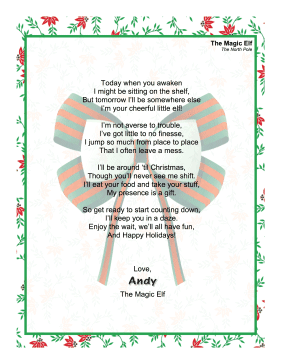 Elf on the Shelf fans will like the poem in this greeting letter from Andy, the Magic Elf, a mischievous elf doll that wanders the house in the days before Christmas. I'm your cheerful little elf! That I often leave a mess. Though you'll never see me shift. My presence is a gift. I'll keep you in a daze.